Tunstall Corp. produces a complete line of thermostatic radiator steam traps with ratings from vacuum to 25 psi. Each unit is tested and inspected before leaving the factory guaranteeing years of trouble free service. All units are “normally open” to expel air and water and will “close” at saturated steam temperature thereby preventing steam from entering into condensate return lines. Each Tunstall steam trap features the Tunstall Capsule® which has become the best steam trap replacement element available today. 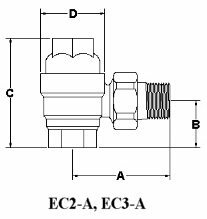 Furnish and install Tunstall Thermostatic Steam Traps Series EC as shown or as specified on plans and in accordance with manufacturer’s instructions, sizes ½” or ¾”. The trap body and cover shall be forged brass and provided with an entirely stainless steel Tunstall Capsule®. Rating shall be _____lbs/hr at _____ PSIG pressure differential. Each unit shall be guaranteed for 2 years from date of installation. The Tunstall Capsule® professionally upgrades all thermostatic steam traps. Refer to catalog #795 for more detailed information. **To convert Square Feet EDR to pounds of condensate per hour: Divide the square foot ratings by 4. One Square Foot EDR is equivalent to net emission of 240 BTU per hour with 215?F steam in the radiator surrounded by 70?F air temperature. One pound of condensate is equivalent to approximately 1000 BTU; 1000 BTU is equivalent to approximately 4 square feet EDR. ***Basic ratings for trap pressures greater than 25 psi are given in lbs of condensate per hour. One pound of condensate is equivalent to approximately 1000 BTU, 1000 BTU is equivalent to approximately 4 square feet EDR.